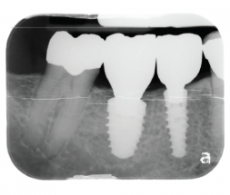 The following three cases demonstrate cases where dental implants were chosen by patients over removable partial dentures to replace missing teeth because they did not want the trouble of instability, bulkiness, and food trapping associated with removable dentures. This patient presented with a chief complaint of his bridge feeling loose. 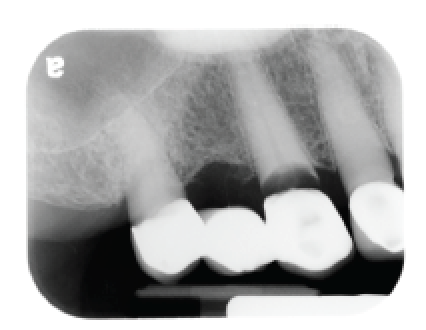 As you can see in the image, the bridge has sheared off of the support tooth (see the horizontal black line on the tooth in the center of the image). By the time he had come in for treatment, the leverage force exerted on the molar (rightmost tooth in image) had broken it as well and it had to be removed also. Replacement options were discussed with the patient (a removable partial denture or dental implants) and the patient decided to have dental implants, as he did not want to bother with the bulk of a denture in his mouth. 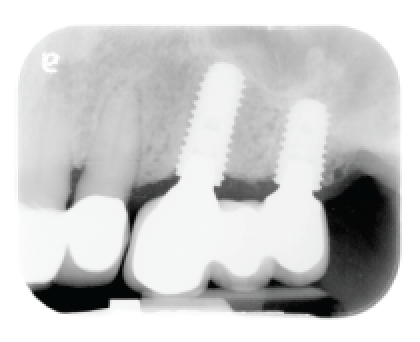 The image to the left shows two dental implants supporting a three-tooth prosthesis. 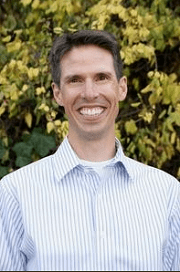 This bridge provided the chewing surface he needed to be able to enjoy the foods he wanted without the bulk and instability associated with a removable partial denture. This patient also presented with a chief complaint of her bridge feeling loose. It is easy to see in the image where decay has completely severed the tooth from the bridge (the black horizontal void on the middle tooth between the root and the crown). In this case, the portion of the bridge on the other support tooth (left most tooth in the image) was intact and in good condition, so the bridge was cut in a way that would preserve the crown on this tooth, thereby reducing costs for the patient. She had worn a removable partial denture on her lower teeth and desired implants to replace her missing upper teeth. The bridge was cut and removed, the decayed tooth root was also removed and two implants were placed as seen in the image below. In this case the root canal on the molar supporting the bridge failed. It is difficult to see in this image. However, if you look closely, you can see that the area in between the root canal tooth roots is dark and without pattern. 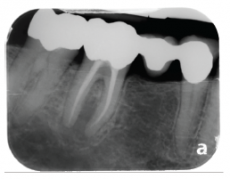 There is an abscess here, secondary to the failure of the root canal. A discussion was had with the patient regarding retreatment of the root canal, apical surgery, or removing the tooth. He decided to have the tooth removed. As in the previous case, the crown on the other support tooth was in good condition and so the bridge was cut in a way to preserve the crown on that tooth and reduce costs for the patient. 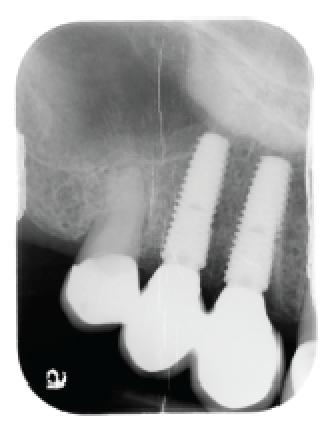 After an appropriate healing time following the tooth removal, two implants were placed and crowns made to fit on them, thereby restoring chewing function to this patient. 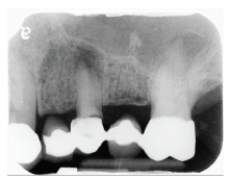 You likely noticed that in each of these cases it was a bridge that failed (yes, in the third case it was a root canal failure, but teeth that are support teeth for bridges are more likely to require root canal treatment due to the stresses placed upon them). Bridges are a very predictable and common way to replace missing teeth. 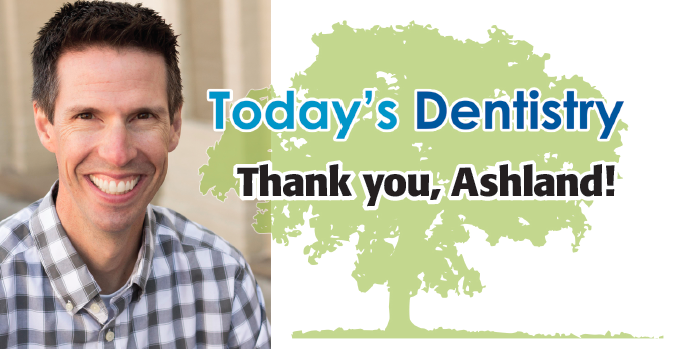 However, with improved implant designs, surgical protocols, and understanding of implant prosthetics, implant dentistry has fast becoming the standard of care for replacing missing teeth. 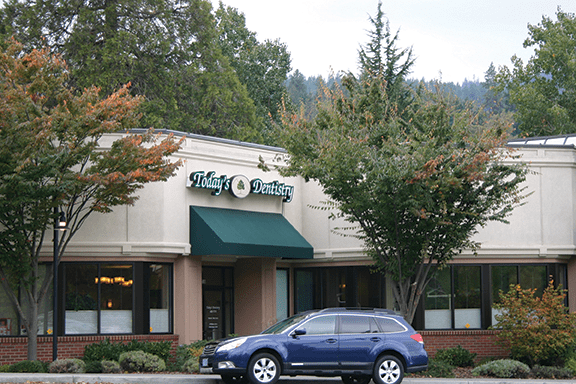 If you are missing teeth and interested in returning your mouth to full function with dental implants, please give our office a call. 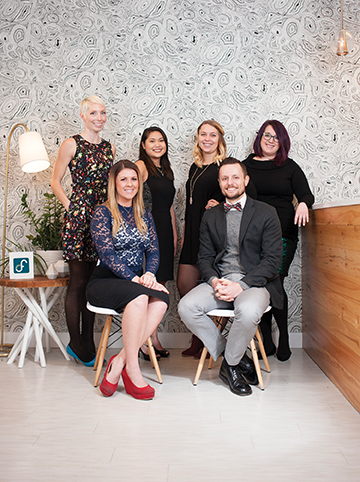 We provide consultations at no charge and will give you honest, no nonsense recommendations to help you achieve your dental goals.